Intense thunderstorms pummeled the tri-state area Wednesday afternoon, bringing flooding downpours that caused mass transit, airport and road delays, and made roads look more like rivers. The thunderstorms rapidly dumped more than an inch of rain in some spots. 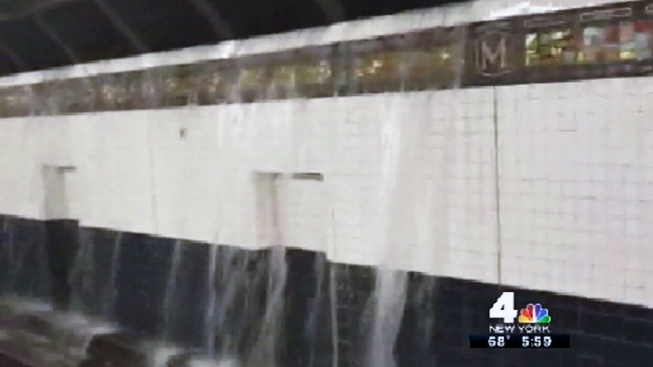 Water pooled in some areas, making roads impassable and flooding some subway stations. 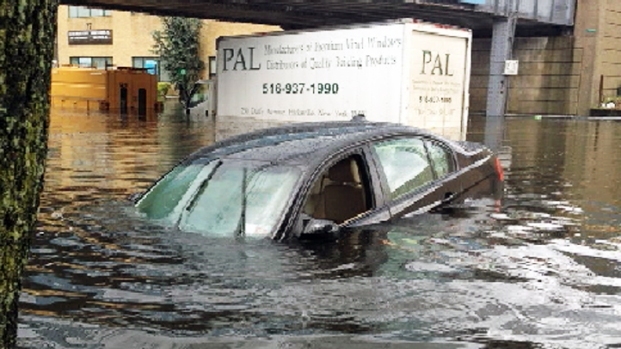 On Long Island, drivers were caught by surprise and had a tough time navigating through the water. "I was going straight on Jericho Turnpike, and within seconds the whole road was flooded," said Marie Koppelman of Bethpage. "I couldn't get past it, and a huge truck came by. My car died, and the level of the water was up to the doors." Several of the hardest hit areas in Wednesday's flooding were on Long Island. Pei-Sze Cheng reports from East Williston. A separate track of storms had barreled across Long Island earlier Wednesday, causing rampant flooding in New Hyde Park. The powerful rain and wind knocked down trees across the village of East Williston in Nassau County. No one was hurt. In addition to the intense bursts of rain, the storms brought gusty winds and dangerous lightning. The flash floods left a wet mess all throughout Glendale, Queens. 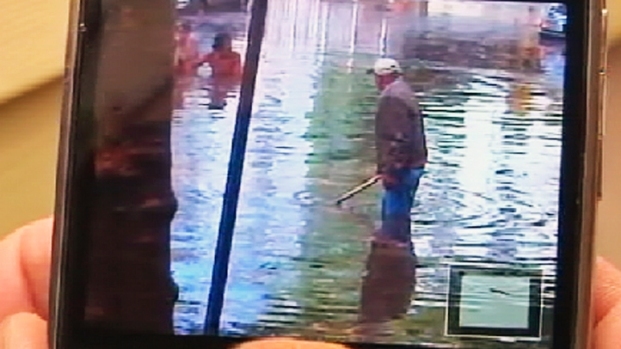 Residents are left cleaning out muck in their homes, streets and cars. Marc Santia has more. In New Jersey, a man fishing at Takanassee Lake in Long Branch was struck by lightning at about 5:15 p.m. He was taken to Monmouth Medical Center in critical condition. About 75 miles north in Bloomingdale, the roof of a house caught fire when lightning struck. The elderly couple who lived there wasn't aware they were in danger until neighbors came and alerted them. Delays of arrivals and departures were reported at all three area airports due to the thunderstorms. A low-hanging tree at the Newkirk Avenue station in Brooklyn had been delaying subway service on the B, N and Q lines. Astoria-bound Q and N trains were delayed and there was no B service in both directions from the Brighton Beach to the Prospect Park station. Some residents reported seeing dime-sized bits of hail pounding their windows and doorsteps. Others reported flooded basements. The storms are expected to push out to sea overnight, clearing the way for a beautiful Thursday with calm skies, cooler temperatures in the mid-80s and a welcome break from the humidity that smothered the tri-state area Wednesday. Forecasters caution the reprieve won't last long, though. The humidity returns Thursday night and Friday ahead of the next cold front, which will likely bring more showers and thunderstorms Friday evening into Saturday. Drier, cooler air is expected to follow the cold front, making for a cooler start to the week Sunday with temperatures in the 70s. Get the latest from NBC 4 New York's weather team anytime, anywhere. Follow us on Twitter, Facebook and Google+. Get our apps here and sign up for email newsletters here. Get breaking news delivered right to your phone -- just text NYBREAKING to 639710. For more info, text HELP. To end, text STOP. Message and data rates may apply.